1844-JUNK-RAT guarantees we have the lowest price in the market!!! Whether you’re renovating home or office, you want expert construction debris removal to handle the job. Aside from being professional, we at 1-844-JUNK-RAT offers fast and reliable service for your junk removal needs in New Jersey. Large space or not, we don’t say no to any construction debris removal in New Jersey. Our crews have gone into intensive training to give you nothing but 100% satisfaction. We do all the lifting, loading, and disposal as you watch us get the job done. 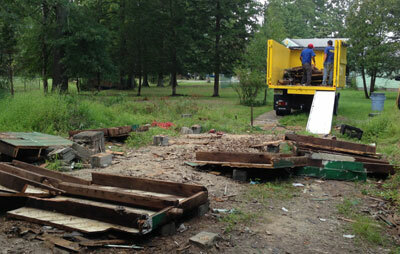 1-844-JUNK-RAT is committed to providing low-cost construction debris removal in New Jersey. In fact, our rates are lower than other local junk removal company by 25%. This is because you’ll pay only for the space you’ve used up in our truck. To quickly get response from your inquiries or reserve a booking, contact us via 1-844-586-5728 or 1844junkrat.com. 1-844-JUNK-RAT, the biggest local junk removal service in New Jersey, is committed to providing quality service while disposing junk responsibly. How it Works - 3 easy steps! Step 1. Request a free estimate and get upfront prices! Just give 1-844-JUNK-RAT a call. Based on the description you give us, we'll be able to give you a rough estimate over the phone. You can also schedule an appointment for one of our uniformed trained professionals to come to you and give you a FREE estimate. Our trained professionals will see all items which need to be removed. Based on how much space your junk will take up in our truck, we will provide you with a flat rate that includes all dumping & labor fees. No hidden fees to be sprung last-minute! Whenever possible, we offer same day or next day junk removal in NJ or NY. While you sit back and relax, we will haul everything to our truck, and do a clean sweep to remove all traces the junk was even there! Just point and we will do the rest! 1-844-JUNK-RAT operates with extreme respect, not just for your home and place of business, but for our environment too. Whenever possible, we donate any reusable items and/or recycle. Junk Rat is always looking at ways to prevent materials from going to a landfill and damaging our environment. Read more about our Responsible Junk Disposal here. 1-844-JUNK-RAT guarantees we have the lowest price in the market!!! You do not have to pay for the truck space that you don't use. You do not have to bag it or place it in any boxes, we will do it ALL for you… All included in the flat fee price!!! We do not charge by the weight or We do not charge by the hour, whatever time takes to do the job, it is on us. All labor included in our prices… We send two people out with the truck. ( If the job is too big we send more people). We think it's more fair to you to price by volume instead of the length of time it takes us to lift and load. Dumping fees are included in the flat fee!!!! Family-owned and operated junk pickup in NJ 1-844-JUNK-RAT has been a family-owned business since 1997. 1-844-JUNK-RAT's friendly uniformed team is trained to be efficient and considerate. Our trash removal company in NJ is also affiliated with the Minority Business Enterprises. 1-844-Junk-Rat donates? Yes they do!!! 1-844-JUNK-RAT donates to different nonprofit organizations and churches. We will not let that good furniture, clothing or shoes go to the trash. One specific place we love to donate is a church in Newark. They do garage sales and with the proceeds support missionaries and orphanages overseas. We feel great helping others! Before you consider another New Jersey junk removal company, consider doing business with a junk pick up company that cares about others in need. We sometimes have a lot and don't realize that just a little pair of shoes will put a smile on a kid's face. Beyond what we do to try to donate as much as we can, 1-844-JUNK-RAT also donates 10% of its net profit to a local church. Same day junk pickup and trash removal with 1-844-JUNK-RAT? You got it! If there are enough hours in the day to do a thorough junk removal and cleanout, we're on it! If for any reason we are not able to do same day pickup, we are surely to accommodate you for a next day pickup. 1-844-Junk-Rat has free estimates! No obligation. Have some rubbish you want to remove, but don't need an expensive and unsightly roll off dumpster in your front yard? Call 1-844-Junk-Rat today for a free estimate. As part of our junk pickup NY services, we will pick up your junk and debris and dispose of it in an environmentally friendly way. Get your free estimate! for your residence or business in New Jersey!